Just like on the other main Hawaiian islands, the weather on Maui's south and west shore is generally drier and sunnier than on the island's north and east shore. That's because the predominant tradewinds are blowing from the northeast about 90% of the time in the summer months (May to September) and about 50% of the time in the winter months (October to April), and these winds bring moisture with them. As these moisture-laden clouds approach the islands, they get stuck on the mountains, where the moisture comes down as rain. The weather on Maui's windward (meaning facing the tradewinds) shore is therefore usually a lot wetter than on the leeward (west) shore. But thanks to the rain, the windward facing shorelines are green and lush with waterfalls cascading down the mountains. The temperatures at sea level on each Maui coastline don't vary much and are about the same. The main difference is the amount of rain and wind that the coastal areas receive. The less windy areas are between Kihei and Makena in South Maui and Lahaina in West Maui. These same areas are also the driest. The summit of Haleakala is the chilliest spot on Maui since it rises 10,023 feet (3,055 m). 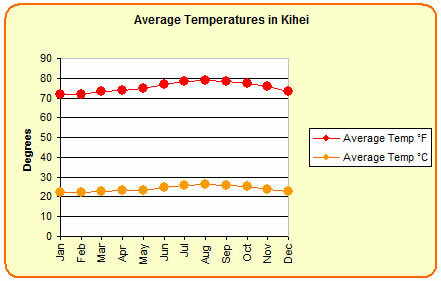 In the winter, the average high temperature is 50°F (10°C) and the average low is 32°F (0°C). In the summer, the average high temperature is 58°F (14°C) and the average low is 38°F (3°C). Maui's average ocean temperature is around 75°F (24°C) in February and 80°F (27°C) in September. Vog (volcanic smog) is much more common on Hawaii's Big Island than on Maui since the Big Island is the only Hawaiian island that still has active volcanoes. About 200 tons of sulfur dioxide and other toxic fumes are spewing out of Kilauea's Pu'u O'o vent each day. Thanks to the tradewinds a lot of these fumes are quickly blown out to sea. Areas around Hawaii Volcanoes National Park and the Big Island's Kona Coast are the most affected by this vog. Occasionally when the winds are blowing from the south (known as Kona winds), the vog from the Big Island's volcanoes affects the air quality of the other Hawaiian islands, including Maui. On those days you will notice a haze in the air, especially when looking into the distance. While most people can tolerate vog and won't notice any difference in how they are feeling, for those with asthma or other breathing problems vog is much more of an issue and it is best be avoided by staying indoors.